The mainstay of treatment of cataracts is surgery. The defective lens is removed and an artificial one inserted in its place. 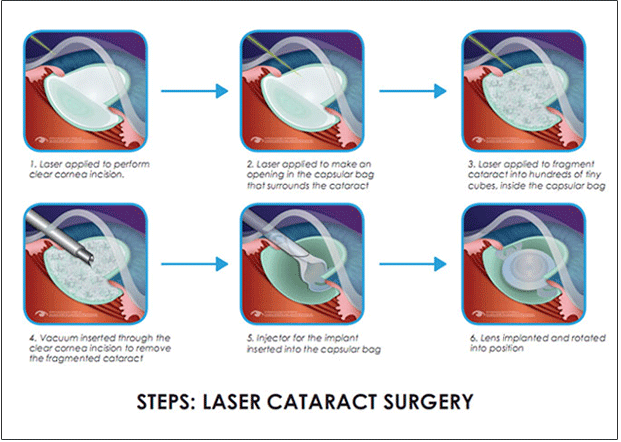 Laser Cataract Surgery is the most advanced technique for cataract extraction surgery. Using a series of lasers comparable to the lasers used in LASIK procedures, tiny incisions are made to the surface of the eye and the cataract is fragmented into hundreds of tiny pieces that are removed from the eye in a technique that has the least amount of collateral damage and risk of complications to the eye and the quickest visual recovery of any previous form of cataract surgery. In modern terms, cataract surgery requires the removal of the lens material using phacoemulsification, a high frequency ultrasound tool. techniques including smaller incisions into the eye associated with less complications compared to what was seen previously.